86% of parents move children into booster seats too soon, according to a recent Safe Kids Worldwide report released yesterday. Even more risky, is one in five parents of young children admits to “bending the rules” when carpooling, letting children ride without car seats, booster seats and sometimes even seatbelts. These statistics and more were published Tuesday in USA Today, NBC News and other credible news outlets. Currently in the middle of Child Passenger Safety week (September 14-20), the study is very timely and reminds us of the importance of safety on the road. 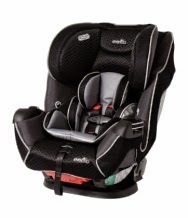 Evenflo Symphony All-In-One car seats grow with children, accommodating children from 5 - 100lbs and is adjustable to rear facing, forward facing harnessed and forward facing booster without harness modes. The Symphony Seats keep car travel safe throughout childhood and may be the only car seat your child will ever need. True safety starts even before you hit the road, especially since over 70% of car seats are incorrectly installed (NHTSA, 2006). Luckily, last month Evenflo introduced the Symphony™ All-in-One car seat with SureSafe Installation that increases proper installation by 2X. This new car seat system features revolutionary LATCH Guides and Quick Connectors to make the installation process easier. Visit Evenflo on their social media below to stay up to date with the latest! Thanks for reading!